It is well know that Kindle ereader doesn’t support DRM ePub ebook, you can’t read DRM epub in Kindle device, ePub DRM Protection prevent you to do that, this is tutorial how to convert DRM ePub to Kindle format, read it in Kindle device, it support ePub ebook purchased from kobo, sony, google play ebook store, and all epub download in Adobe digital editions. When you have bought the drmed books, you just need this simple way to resolve the conversion matter. It is very convenient for readers to convert EPUB to Kindle no matter the books contain drm or not. How to convert drm epub to Kindle? 1. First of all, if you have not installed Adobe Digital Editions, click here to download it. Then use your Adobe ID account to activate the Adobe Digital editions on the current computer. There is something that you need to pay attention to: If your EPUB books are downloaded or copied from other devices, they are not able to be converted. And if so, you need to use Adobe Digital Editions to re-download the books into your current computer. 2. Download and install ePub Converter, it’s one of the best ebook conversion tools to help you convert drm epub file to Kindle mobi format. 3. Run ePub Converter, click “Digital Editions” button to import Adobe DRM epub file into converter, if you have B&N ebook, just click “Nook” button to import nook ebook. 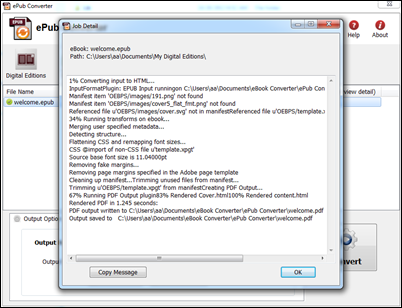 user also click “Open” button to open digital editions folder, drag drop epub file into converter window. 4. Select “Kindle Mobi format” as output format, then Click “Convert” button to start job, it takes time to convert to other format, wait until job finished. converter supports batch conversion mode, And conversion process is promised without any quality loss to your files. The books will still keep the same quality as the original one. 5. After you succeeded in converting EPUB to Kindle mobi format, you can read your ebook in kindle device. 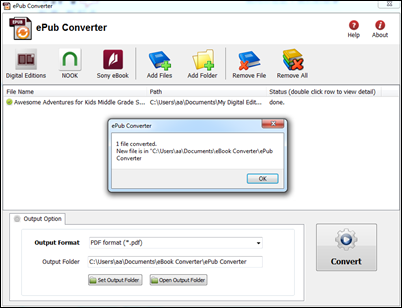 6. if conversion fails, double-click file name in list in converter windows, you get error message in detail. Epub file format is an ebook standard format. it is supported by the majority of the reader devices in the market, such as: Adobe Digital Editions, Google Books, iBooks, Calibre. Convert DRM epub to PDF iPad? How to download Google Books to PDF?